A guest post from our globe-trotting and sometimes DC-based friend, Michael Turner. “I like hot sauces. I’ve been lucky enough to try them in Thailand, Indonesia, China, Mexico, Colombia and points in between. What I’ve noticed is that the ingredient list isn’t long or complicated. Usually it’s just peppers, salt and vinegar. You don’t have to be a talented chef/chemist to make your own. So I do. It takes about an hour to make. Put on some surgical or dishwashing gloves. (The doctor will see you now… gloves prevent the peppers from burning your hands as you will be chopping many of them.) Use a knife to remove the stems and white parts of a bunch of same-colored peppers. Coarsely chop and place into food processor. 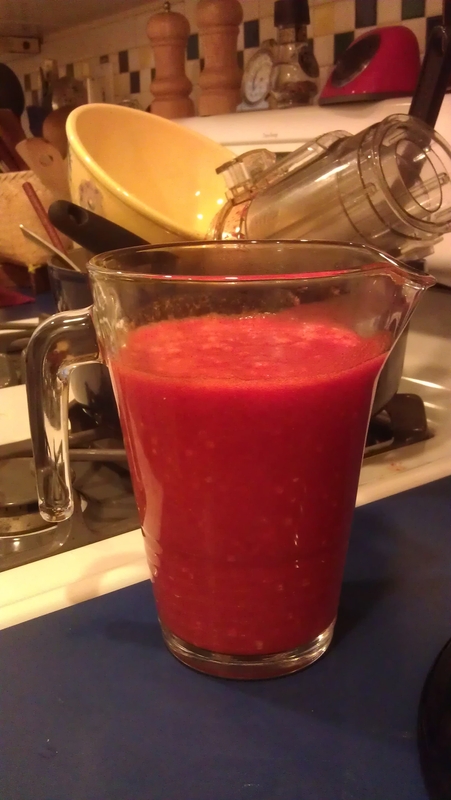 The more seeds in the food processor, the hotter the sauce. Pour enough vinegar into the food processor to get a really good purée going. Pour the purée into a pot and slowly bring to a simmer for 5-7 minutes, stirring often. As you’re bringing to a simmer, add as much vinegar as you want to make the sauce as thick or thin as you like. Throw in a handful of salt. (You can always add more later). After simmering the hot sauce, put back in food processor and purée once again. Put in a glass pitcher (or other nonreactive container), cover with a cloth and let sit for two days on the countertop. Don’t worry: It’ll keep. Its very easy! I highly suggest trying the very popular peach habanero sauce. The recipe is at allrecipes, its a little more involved, but its great and makes the perfect gift.